Krytens Hands from series 7. Screen matched to episode Blue. Screen matching props to scenes is not easy, and requires a lot of patience. 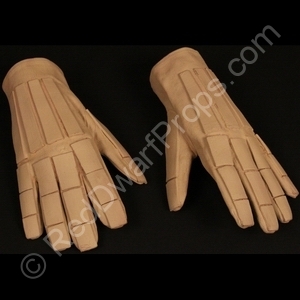 But I’m certain this pair of Krytens Hands or gloves, can be matched to the 5th episode of Series 7. I checked other episodes too, but not often do you see a close-up with enough detail at the right angle. 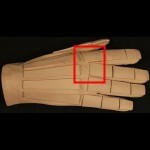 So it’s possible this pair of Krytens Hands made other appearances. Having poured over many an episode at super slow speed, what I do know for sure is there were many pairs of hands used, and not all of them look alike upon a close inspection. Here you can see a still from a scene in Blue on the left; and a photo of my prop on the right. The middle finger on the right hand sits kind of strange, with the 1st “panel” not aligned, set back and at an angle with the other fingers/panels. Other episodes I have looked at, where you do get a good enough close-up, look very different to this, and different in their own way. 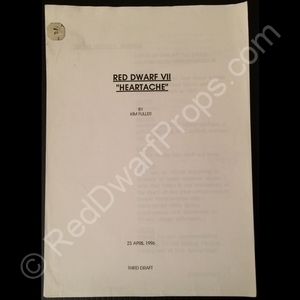 I also have an original matching script written by Kim Fuller, under the working title of Heartache. 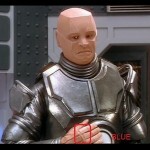 Tagged 1997, Blue, Heartache, Kryten, Robert Llewllyn, Script, Series VII. Bookmark the permalink.